If you currently have a Fransat box and card, but would like the BIS channels as well, there is now an option to update your Fransat card with the BIS card ‘rights’. 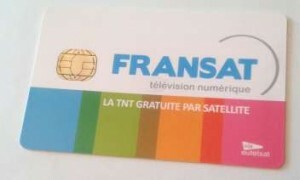 So without a physical BIS card , you can use the Fransat system to get both sets of channels. This is a big advantage to users with single card slot boxes, no need to update the box, just email me to arrange to add BIS rights to your existing Fransat card. BIS channels are available from Hotbird ( Eutelsat 13) AND Eutelsat 5w ( ex Atlantic Bird satellite ) so whichever your dish is pointing at, if you have a Fransat or satellite receiver with a Viaccess decoder, BIS can be available to you. Our current favourite Fransat box, the Aston Diva Premium HD, has 2 card slots, so you can sign up for BIS, anytime after installation, with a BIS card or with rights transfer. BIS has just added a sports package – the ” Be In ” at a low price you can now keep up to date with the best of French Sports. This is available to existing viewers having the Fransat package and BIS viewers on the Hotbird satellite. The channels from the BIS card, which is a 12 month subscription are to be found on the same page in a pink background. Best of all ( in your humble reviewers opinion ) is the TNT and FranSat packages, for a one-off payment, you have most of the same channels as the BIS card but no yearly renewal, TNT are saying the card will be valid for 4 years – quite a bargain! On the downside a special receiver is required, no CAM has yet been made to allow other receivers to be used. There are receivers from Strong, Visiosat and Sagem for normal SD use. Now up and running is the new FranSat service. It carries exactly the same channel line up as TNT. Because historically France has had 2 satellites delivering the programming, this second ‘free’ digital broadcast service has been put into operation for the many viewers already having a dish set up for 5 degrees West. Not yet established fully into the commercial centres you may get a few blank looks when you ask for a Fransat set top box! But it will soon be available everywhere in France. Here in the Uk they are still quite expensive compared with the TNT offerings. It would be a good choice for anyone with an obstruction in the way of the TNT 19 degree satellite, as it comes from 5 degrees west. The last option is to buy a Canal sat ( Canal+) card, lots of subscription channels on this card and quite a price ( approx £850 ) for the year. Also a receiver with CAM slot is required and a Seca3/Nagra3 CAM at about £90 . To add to the complexity of ordering an Official French address is needed before you can subscribe.